VOCAL’s extensive background in the design and implementation of mobile, radio, and telephony solutions will help you meet your low bandwidth and low power needs. The use of MELP 2400 bps with RTP and SDP is described in detail in RTP Payload Format for MELPe Codec. VOCAL’s MELP codec source code (C and assembly) is optimized for performance on DSPs and conventional processors from TI, ADI, ARM, Intel and other leading vendors. MELP is available either standalone, as a library, or with a VoIP stack that can be easily integrated with your application. Custom designs are also available to meet your specific needs. Contact us to discuss your voice application performance requirements. The MELP vocoder evolved from improvements and modifications to another code excited linear predictive (CELP) coder known as LPC-10. An enhanced version of the MELP algorithm is available, the mixed-excitation linear predictive enhanced (MELP enhanced or MELPe) vocoder. The MELP voice compression algorithm specifies the 2400 bps mode of operation with an optional postfilter available for the decoder. The MELP frame size is 22.5 ms in duration with each frame containing 180 digital voice samples at a sampling rate of 8,000 Hz. Recommended analog requirements are for a nominal bandwidth ranging from 100 – 3800 Hz. 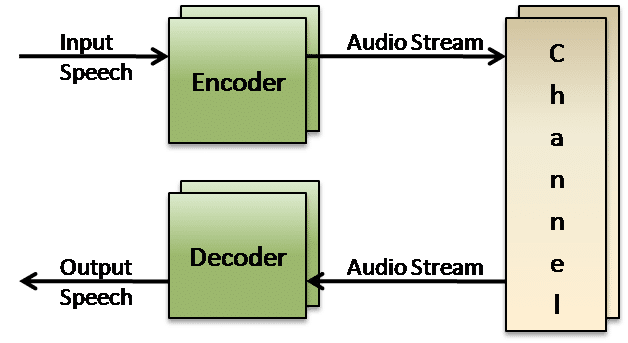 Although the MELP encoder audio compression algorithm can operate with a limited low bandwidth signal, there is some degradation in performance. MELP encoding is robust in difficult acoustic environments with significant background noise and reverberation such as those frequently encountered in commercial and military communication systems. The MELP encoder speech compression algorithm is very efficient in its computational requirements. This translates into relatively low power consumption, an important consideration for portable systems. The MELP decoder uses extensive lookup tables and models of the human voice to extract and regenerate speech. The MELP algorithm is tuned to regenerate the English language and, as a result, speakers of non-Germanic languages generally rate MELP speech intelligibility more poorly than English speakers. MELP vocoder audio quality is achieved using a mixed-excitation model that can produce more natural sounding speech than traditional pitched-excited LPC speech coders because the MELP algorithm can represent a richer ensemble of possible speech characteristics. The LPC vocoders use either a periodic pulse train or white noise as the excitation for an all-pole synthesis filter. These vocoders do produce intelligible speech at very low bit rates, but they sometimes sound mechanical or buzzy and are prone to annoying thumps and tonal noises. These problems arise from the inability of a simple pulse train used in LPC algorithms to reproduce a complete range of voiced audio. VOCAL’s optimized vocoder software is available for the following platforms. Please contact us for specific MELP codec supported platforms.